(Above) An impressive 5 x 7 inch autochrome, circa 1905, from the gallery of Alex Novak and Marthe Smith. Learn more at 212.822.5662 or visit their website at www.vintageworks.net. Click for larger view. Be sure and click on images for a larger view. 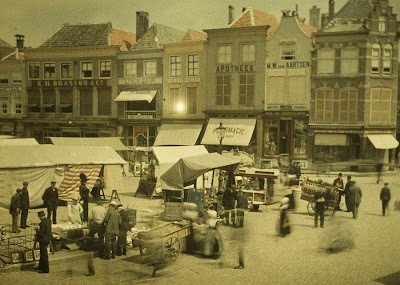 All of these photos were made in Belgium around 1900 to 1910! IF YOU COULD SEE BACK 110 YEARS, just for a moment—the people and their dress, a city street or country path in real color, that would be pretty amazing, wouldn’t it? Just a few years ago, color photos and movie film of World War II was made available for the first time that documented various aspects of the war. Even during 1940-45, color film was quite rare. The few color photos that I have seen reproduced of soldiers and the war (rather than in B&W) brings the distant past a lot closer. Of course, it wasn’t until the 1950’s that color was finally introduced to the world—and even then, it had its limitations. But did you know that color images were being made at the turn of the 20th century? 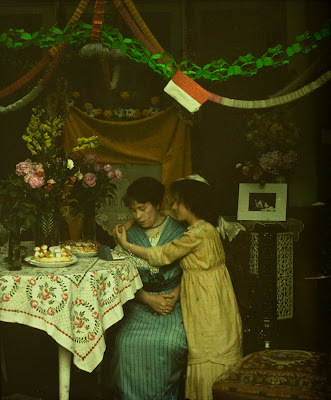 The process was called the autochrome, and it was a complicated process using, of all things... potatoes. 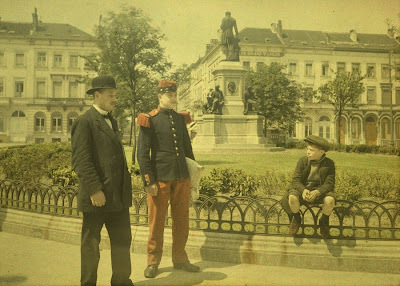 If it wasn’t an autochrome, any color images you might find from that period or before were hand-colored tintypes, Daguerreotypes, and other monochromatic processes. Here, for the first time, was a process that could truly capture the ambient color of the day. It looked a lot like a glass slide, and was about 4 x 5 inches (and larger) in size. The autochrome process was invented during the years 1895-1903, by the French brothers Louis Lumière (1864-1947 and Auguste Lumière (1862-1954). It took them four further years to work out and refine the several fabrication processes. 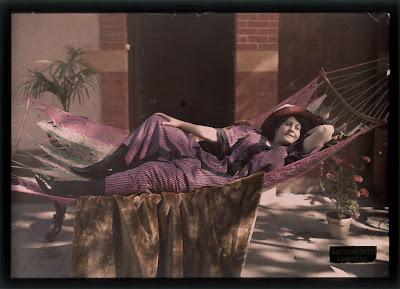 Finally in 1907 the autochrome plates came on the market and were an instant success. 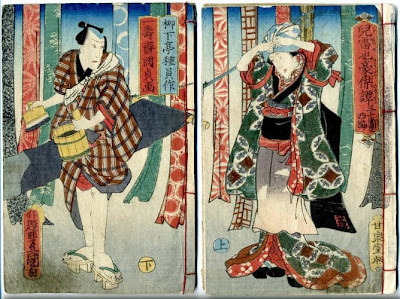 Until now, the photographers’ only way to produce color was tinting the plates by hand which was done by many photographers with breathtaking artistry. The nucleus of autochrome glass plates are dyed grains of potato starch measuring between 0.006—0.025mm. Make three heaps of starch, dye each pile in respectively violet, green and orange. Make a mix of these three different colored grain starches. You need a glass plate between 0.9 and 1.8mm thick. First you have to varnish the plate with a latex based varnish. Blow the colored mix of grains on the varnished plate. Gently brush the plate to remove the surplus grains. Next, a fine layer of charcoal is applied to fill the interstices between the grains. The whole plate then has to be pressed to reduce overall thickness of layers. After pressing, apply a second layer of varnish. To finish off, place a panchromatic emulsion layer. This is briefly the production process of an autochrome plate, but imagine for all the different production stages industrial machines had to be invented to produce plates on a grand scale. There are between 6,000 to 7,000 grains on a square millimeter. A rolling pressure of 5000 kg per square centimeter had to be achieved to press the layers without breaking the fragile glass plate. 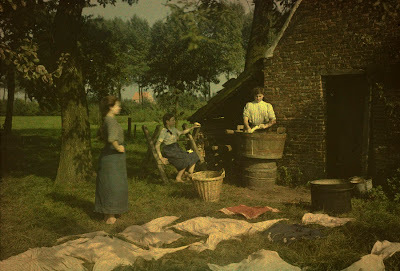 Around 1914 the daily production was 6,000 autochrome plates. It is estimated that between 1907 and 1932 around 20 million plates were sold. 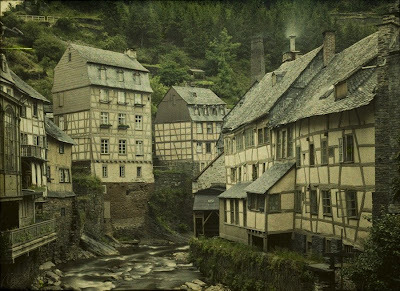 The biggest collection of autochromes (72,000 plates) is housed at the Albert Kahn Museum at Boulogne Billancourt, France. WHAT MAKES A GREAT SNAPSHOT? As a general rule, many of the same things that one might use to judge any artwork fall into play. Connoisseurship in any field has its criteria. My good friend Brian loves great automobiles. If I were to ask him what makes a great automobile, I would guess him to say craftsmanship, performance, design, quality—those kind of things. Notice I didn’t say anything about cost. If I had asked him “what are the qualities of the most expensive cars in the world?” that is a different question altogether. Then, he might say something like rarity, being first. To that point, an 1898 one-off prototype of a steam-powered car (ugly, by many standards) might trump the very first Mercedes, for example. But then again, maybe not. But I have opened a can of worms here—in a field I know little about. I do know that the art—the design— of an automobile can give it immortality. Raymond Loewy’s Avanti, for example, still turns heads today if you would be fortunate enough to see one. Uncle Charlie, who has his Brownie camera with him one day to get a few shots of his friend’s retirement party, is leaving work when sees a blimp flying overhead and remembers he still has a picture left. He thinks the sighting of a blimp unusual enough to want to record it. He tried to get directly under it but it is moving too fast. Charlie thinks: “Damn that building! If only I had a better shot! Oh, what the hell!” *Click! * When the pictures come back from the drugstore, he is probably bothered a bit by all the intrusions that came with the picture, like the pole, wire, the two buildings—but, he thinks, at least I got my picture. Mission accomplished. 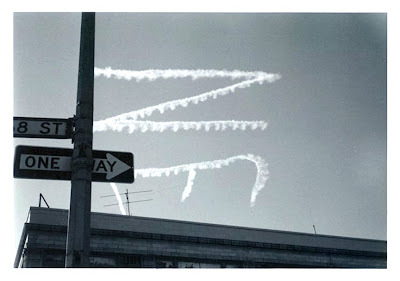 Now, if the great modernist photographer Lee Friedlander happened to have been there on the same day, the last thing he would have wanted was a single shot of the belly of the blimp. Chances are he would have run to the alley and tried to get a shot similar to the one that Uncle Charlie took, which was basically by accident and default. 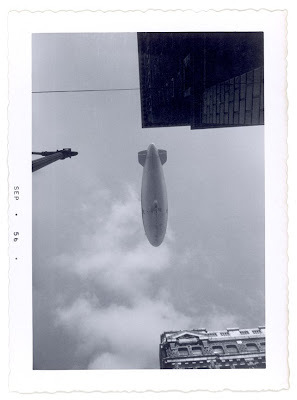 Friedlander would have reveled in the juxtapositions of the blimp to the wire and the buildings to the blimp and seized upon that very moment. Could he have taken a better picture of that blimp on that day? Probably. 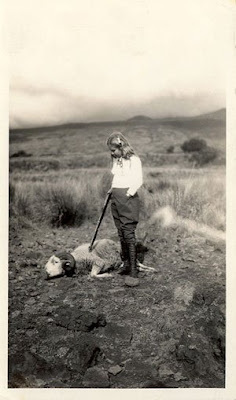 But Uncle Charlie stumbled onto this great photo—in spite of himself. 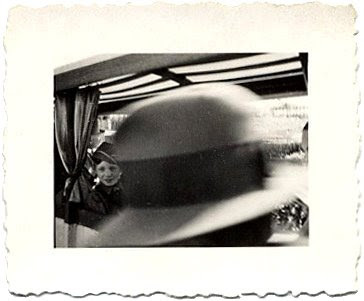 It is doubtful that this anonymous snapshot shooter allowed his mind to make the critical analysis that a trained photographer might have done. So, what about that criteria? What do I look for in a great snapshot? Well, the great snapshots are absolutely rare. You have to figure that 99% of the time there is no negative, so this is all you will ever have of this particular view. What you are holding in your hand is the only existing image of this particular shot. For example, there are millions of pictures of men in hats. But only ONE like the one you see above. That makes it a one-of-a-kind. Add to that the qualities I list for you below—and you have a great photo. When I look at a snapshot I look for the following things: (1) composition: simply, does it work as a picture? (2) tonality: does it have a full-range of values, from white to gray to black? Or, does it break this rule for something more dramatic or sublime? (3) content: what is it a picture of? Is the image unusual, with uncommon subject matter? Does it challenge me visually? Is there a surprise, something unexpected? Do I continue to see more the longer I look? (4) condition: Is the photo is good shape? Is it bent, wrinkled or damaged? Or, is it pristine? (5) My last criteria, and this is personal to my collecting eye: does the snapshot remind me of something a great photographer might have taken? 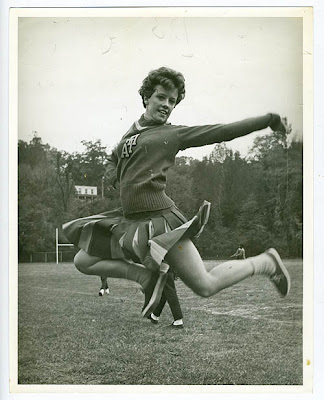 Is it a little Diane Arbus? 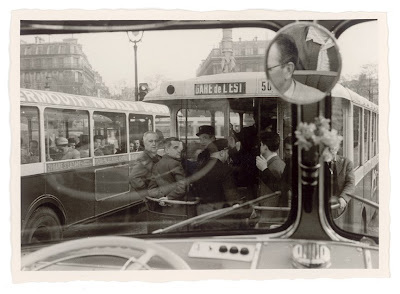 Is it an “accidental” Weegee, Friedlander, Siskind, Steiglitz, Strand or other? I’ll be showcasing some other snapshots from time-to-time. Thanks and stay tuned. An AM repost from 1/15/09. (Above) Steven Meisel, (b. 1954) photographer, cover of Italian Vogue. (Above and following) Steven Meisel, additional works. 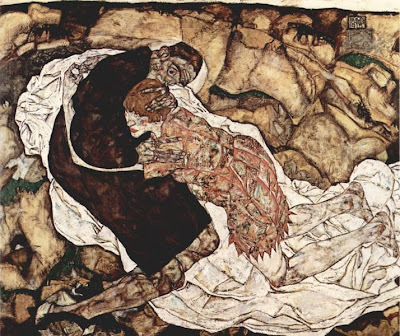 Egon Schiele (1890 - 1918) “Death and the Woman,” painted in 1915. 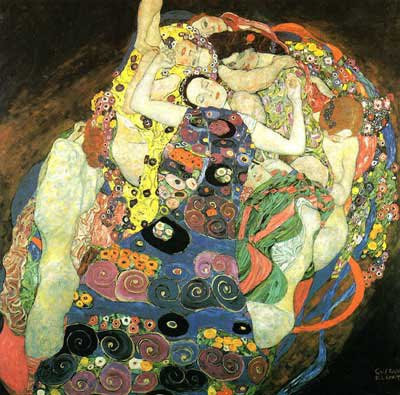 (Above) Gustav Klimt (1862 - 1918) “The Maiden,” painted in 1912. THERE IS NO QUESTION photographer Steven Meisel (b. 1954) is a great fashion photographer. 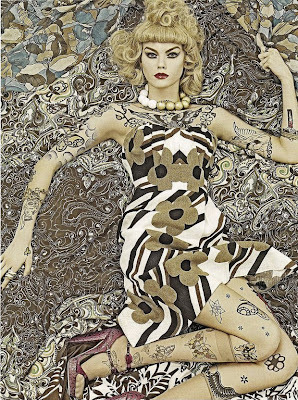 I thought it would be interesting to show some of his recent work, which is gorgeous, and some other art historical references with excessive pattern clashes that relates to that. 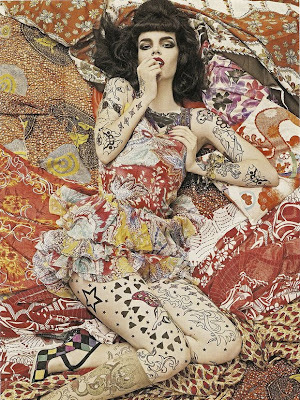 Being an informed artist, Meisel was certainly knowledgeable of the work of painters Gustav Klimt and Egon Schiele of the Austrian Secessionist movement at the turn of the 20th century. These painters, especially Klimt, explored fully this notion of the human figure entwined with and melting into the immediate surroundings. Schiele was knowledgeable of the older, more respected Klimt—and certain pieces of his work reflect that. Schiele’s life was tragic—persecuted by the law for “pornographic” drawings, he died at the young age of 28—a victim of the Spanish flu epidemic of Europe that took 20 million lives in 1918. 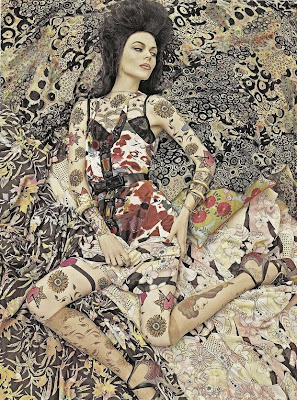 Certainly, Meisel knew of the incredible work of Verushka, basically the world’s first supermodel, and her camoflauge series, where she would use body paint to become (or blend into) wood, rocks or the landscape. 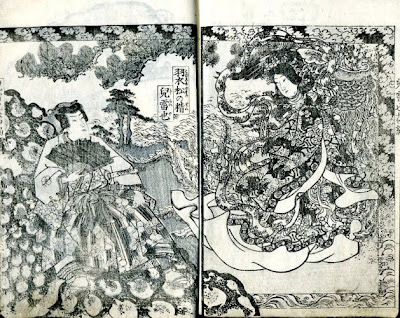 The 19th century Japanese woodcuts, though more obscure—explore similar graphic devices of patterning. An AM repost from 2/12/09. FOR THE OCCASION OF THIS SUPERBOWL SUNDAY 2012, I have to ask this question: was there anything more hilarious than this style of “run and leap” sports photography? You know the kind. 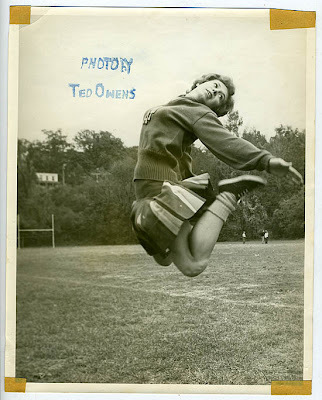 They were in every high school yearbook in the 1950s. 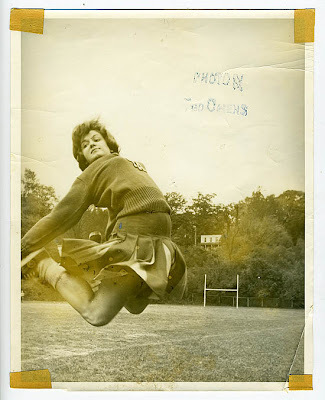 Somebody did it first—and every yearbook photographer since followed suit. 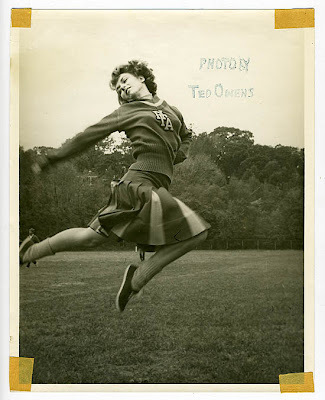 The football players did it especially, the running leap, fore arm out. But the cheerleaders? 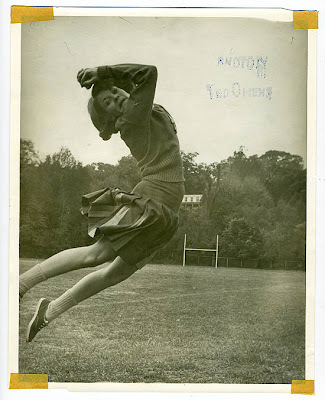 With leaps like these, it’s a wonder they didn’t fall and break something. 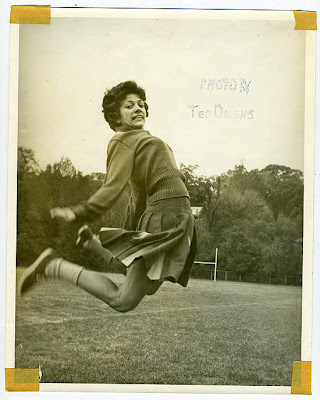 I am not sure when the crazy leaps went out of fashion, but it’s a good thing. An AM reprint from 6/6/09.